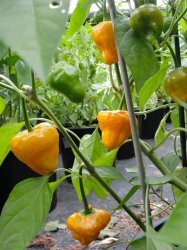 These lantern-like peppers grow under the leaves, and when ripe mature from yellow sometimes to orange to fiery red. Similar to the habanero, only mine is bigger, better and yields more. The Jamaican has a great flavor without the aftertaste of the habanero. Great to freeze and enjoy all winter long. These peppers are great for making jerk dry rubs and seasonings.